It has been a long while since I made pot roast. I don’t get a major craving for a pot roast dinner very often but when I do, I usually prepare it the same way every time. Brown the roast and cook in the crock pot with a packet of seasoning and some carrots, onions and potatoes, pretty basic boring. That is exactly what I set out to do when pot roast ended up on the menu plan. Hi, I’m Erin and I am an exact recipe follower. As it turns out, I have become a little more daring in my preparation of meals as of late. It may have something to do with starting this blog and actually cooking on a regular basis. Go figure. You would have been so proud of me, I didn’t even bat an eye. I just started making adjustments according to what I felt would work well together without an ounce of guilt. I will tell you, I felt a little bit of my inner rebel making an appearance and I’m likin her. Season your beef with allspice, some cinnamon and salt and pepper. Brown both sides in olive oil preheated in a large skillet. Add a layer of carrots, celery and onions to the bottom of your crock pot. Like a bed for your roast to rest on while he is getting nice and tasti-fied. Lay him on his bed. Very comfy. I was watching Sandra Lee on the Food Network and she was making something in the crock pot and she told me, (yep, she was talking right to me), that the crock pot has to be the same temperature as whatever you are putting inside it. She was super serious. I don’t even remember why she said it was important but now I have a crock pot temperature phobia. Thank you for that Sandra Lee. Surround Chuck with the remaining carrots, onions and celery and add in the sweet potatoes. Season with the remaining cinnamon, thyme, marjoram and bay leaves. Pour in the wine. I don’t have a shot of me pouring in the wine but it was a beautiful thing. Cover and cook on high for 4 to 6 hours or my favorite, low for 8 to 10 hours. And don’t forget the gravy. I have never made gravy for my pot roast before. The packet that I used to add thickened the broth for me. It’s not hard at all. Just pour the broth from the crock pot in a large skillet, mix some cornstarch with a little water and whisk it up. Add the cornstarch mixture to the broth and continue to stir until you get the consistency you want. You can even mix the cornstarch with some more wine instead of the water if you want it to taste more um, winey. And there you have it. 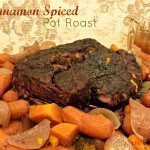 Your not so basic Cinnamon Spiced Pot Roast. Preheat 1 tablespoon olive oil in a large skillet over medium-high heat. Season both sides of the chuck roast with 1 teaspoon of the cinnamon, allspice and salt and pepper to taste. Place the roast in the skillet and brown on both sides. Place a layer of celery, onion and carrots on the bottom of a crock pot. Place the browned roast on top of the vegetables and surround the roast with the remaining celery, onion and carrots then add the sweet potatoes. Season the veggies with the thyme, marjoram a the remaining teaspoon of cinnamon. Add in the bay leaves and pour in the wine. Cover and cook for 4 to 6 hours on high or 8 to 10 hours on low. For the gravy, heat the broth from the roast in a skillet to boiling. Mix the cornstarch with the water and whisk it into the broth continuing to cook until the gravy is thickened. Drooling over here! I love adding cinnamon to meat; it’s such an unexpected hint of spice and sweetness, and I can only imagine how scrumptious it made this pot roast. It was pleasantly surprised and had enough leftover for pot pies, yay!